The New Intimidator Beam LED 350 projects a tight, 4-degree, super-bright beam. Complete with an 8-position color wheel, a 5-position fixed gobo wheel with an animation effect, and a 3-facet prism, this light cuts through haze with lightning-fast speed, creating a brilliant shaft of light and defined aerial effects. This fixture can also serve dual roles, by utilizing the frost filter you can attain effective wash effect as well. 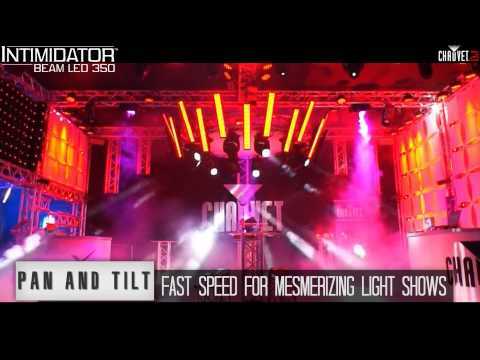 Considering purchasing the Chauvet Intimidator Beam LED 350? Have questions? Ask people who've recently bought one. Do you own the Chauvet Intimidator Beam LED 350? Why not write a review based on your experience with it. Seen a video for Chauvet Intimidator Beam LED 350 online or have you own video? 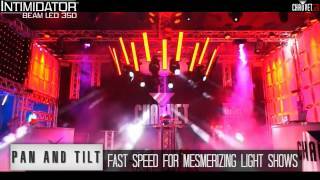 Check out Chauvet Intimidator Beam LED 350 on DJkit.com!